I see a lot of complaints regarding boots not being available for women. I read one referring to a boot with a 4" heel. I think everyone should know there are Riding boots, After riding boots and Fashion boots. Each one serves a funtion. 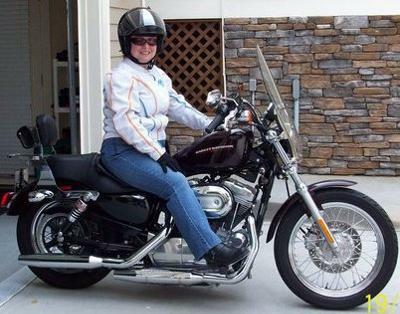 My H-D riding boots have a low heel, hard square toe box and are heavy to protect my foot and ankles from the road. My after riding boots are soft with a rounded toe box and a 2" heel, a nice change after a day of riding. My fashion boots are just that. If I am not riding and my feet are not sore and I am just going out to meet friends who ride, I wear my fashion boots with the higher heels. None of the boots are designed to meet all needs. You would not want to ride wearing a soft after riding boot or fashion boots, they are just not made or designed for riding. I wouldn't want to clomp around after a day of riding in my now sweaty, heavy riding boots, my feet need a break after riding. So, know the purpose of the boots which you are considering purchasing and if you can't decide by looking at them ask a sales person if they are riding, after riding or fashion boots. Get the right boot and both you and your feet will be happy. HD Gear on my Suzuki? HD boots on a Ninja 250? I looked at the HD boots at a dealership and none of the "riding" boots looked feminine or sporty enough to suit me. I settled on the Icon Bombshell boots which are very protective, but do show marks from shifter use, and could use a more agressive sole, which I plan to have done at a cobler this winter. Does anyone else were HD boots on non HD bikes? i have a pair of milwaukee riding boots and an eddie moran riding boot. both about $50 less expensive than a harley boot, even though they are probably made in the same factory in china. both are men's boots as i wear a women's size 11 shoe and it's hard to find women's riding boots in size 11, that are truly riding boots and not fashion boots. i've been riding my own motorcycle since high school, almost 40 years. Finding boots I liked was a problem. First pair my husband purchased online for me, didn't like them, but better than nothing. I, too, believe in proper gear. Finally, found a "more fashionable" kind that I thought would work, but they were too flimsy, in fact, wore them daily for a month while in FL and the upper leather wore out and they weren't very warn in cold weather. Not good. Went shopping in SD with my daughter and found a Harley pair, very comfortable, but clunky, but, I wear them every time I ride. Holding up very well. Still looking for a classier type, sturdy bike boot. I'm positive that, in time, they will cross my path. I have a pair of Oxtar touring boots they are very comfortable for riding or walking I wear them all the time they have a zipper closure no laces to deal with and armor in the ankle non slip soles. I would recommend these boots to anyone. Thanks Dawn, I didn't relize that the Harley-Davidson boots had the purpose on the tags. LOL! I just hought my sales person was that knowledgable! Of course I am 60 and my reading little print vision is not as good as it used to be. ;-) I can drive without glasses, just can't read fine print. Road signs I can read, but I wear my Rx sunglasses just to be safe. Cannot ever be too safe on your bike. Changed my definition of "style"! I bought the HOTTEST pair of boots the day we got our leather jackets - a full 6 months before we got bikes - and I still wear them...to work, out for the evening, shopping even. But when I wore them as a "riding" boot, I quickly realized they would not do. I recognized that their inferior grade materials were not made to protect my feet and ankles; their 2 inch heel and regular sole were not made for shifting OR holding up the bike at a stop with loose gravel or slick oil at the intersection. They may LOOK great, but that's not why I purchased a boot - I just bought without researching...and the laces up the back mimicked the lacing on my jacket! Then I started shopping for a "riding" boot; LOTS more cute but totally inappropriate styles were presented to me on-line...along with some really industrial military work boots. I spent weeks googling and shopping and reading reviews and studying styles. During that time, my own perception of "cute" began to expand...no, my "biker boots" have no place in the office with ANY of my work outfits...just like my fashion boots don't belong on the bike. My perception of style and function began to emerge, and I finally settled on a pair of Milwaukee Renegades. I liked the silver accents on toes and in laces and the rugged no-nonsense, "take-me-serious" look they provided, not to mention the AWESOME functionality. They are a bit heavy, but I don't wear them shopping. At first they took forever to get on and off - I still may go for the zipper style next time - but that will be a while as these are made to last forever! Now, I can get them on much more quickly as they are better broken in. I like the lace holder that snaps over, although one strap buckle flaps annoyingly when I walk. But I'm big on All The Gear All The Time, and my Renegades honor that and look good riding, too! I have Harley Davidson riding boots and Harley Davidson after riding boots. I wear the riding boots every time I ride, they are sturdy, chunky and safer than the after riding boots. I can wear them for extended periods of time also, I have walked Sturgis in them for days at a time and in fact when we take bike trips they are the only shoes I take because we only have so much room to pack. I am thinking of looking into some lighter riding boots that I have heard about but am not sure of their safety as compared to the old heavy leather standard. But it never hurts to look and research. I have Harley boots, and I really like them and I can wear them all day if I have to. They are the engineer style without laces. Not much ankle support, but better movement. Check the tags. At least on the Harley brand, they list their purpose on the tag. Riding boots will usually have some sort of grease resistance, anti-vibration insoles, and non-skid bottoms. They will also be heavy sturdy leather. Not flimsy leather or imitation. When I first started riding, I just used fashion boots, and thought because they looked like riding boots they were OK. Not true, they conducted heat and I burnt my leg on the muffler and the soles were slippery on the road. To those who say they only see the 4" heeled ones, keep looking. Sadly, you can't tell them from the men's. Riding boots are ugly and sturdy and clunky. They are functional not fashionable. I have riding boot, after riding boots, and fashion boots. When I ride I wear my riding boot- always! I have worn then to Sturgis, and not having room for my other boots, just wore my riding boots all week. I thought that my feet would be tired, but my feet stayed comfortable even walking around all evening. I guess it depends on the boots you choose.